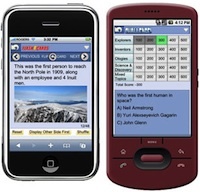 Respondus has added mobile device support to its StudyMate Class software through two enhancements: a free standalone app called StudyMate LMS Edition and new support for mobile browsers within the Web-based StudyMate Class itself. StudyMate Class is a learning system designed for academic subject matter requiring the retention of large amounts of facts and vocabulary terms such as history, the life sciences, and foreign languages. The software generates learning activities from content authored by instructors and even students if desired. Twelve categories of activities and games are available for the system, including fact cards organized by category or topic that present concepts and facts to students, flash cards intended for vocabulary or nomenclature review that can include images, and fill in the blank drills requiring students to type answers to questions with correct spelling. StudyMate Class also provides learning opportunities through games, which present class information in the form of a puzzle to be solved or a game show-like contest. For example, the challenge game presents students with questions arranged by difficulty level, with higher point values for harder questions. The objective of the game is to achieve the best score and may be played competitively against another student. Users can then test themselves after completing learning activities and games with self-assessments. Content entry is managed through an editing tab that provides various templates organized by intention for usage. Individual templates can then be exported into activity projects. Editing privileges can also be modified, allowing student content creation (if appropriate) to the class. The software integrates with the Moodle, Blackboard, and Angel learning management systems and can be run on any platform that supports them. Users can now access StudyMate on mobile devices including the iPad, iPhone, iPod touch, Android, BlackBerry, and Palm Pre with this latest enhancements to the application. A free three-month pilot license is available that reverts to a feature-limited version if not purchased by the expiration date. Pricing starts at $2,995 for institutions with enrollment below 2,000 students and increases according to student FTE enrollment size.